Home » Bills » Should adequacy funding pay for charter school expansion? Should adequacy funding pay for charter school expansion? HB 435 will come to the House floor in March with a recommendation of interim study (13-8) from the Finance Committee. The bill carries a large price tag. Now that charter enrollment is growing so quickly, the $1,231 per student increase in HB 435, with further automatic increases every year, would have a major impact on the General Fund. If enrollment continues to grow at its current rate, the price tag for HB 435 could be as much as $117 million over the next 3 years. Sponsor Rep. Ken Weyler (R-Kingston) proposes that the money could come out of adequacy funding. Legislators from Dover and the other towns losing funding to the “adequacy cap” are bound to take issue with that. Berlin and other property poor towns looking for more aid wouldn’t like it either. Interim study is the right recommendation so the Legislature can find a real solution to charter funding. 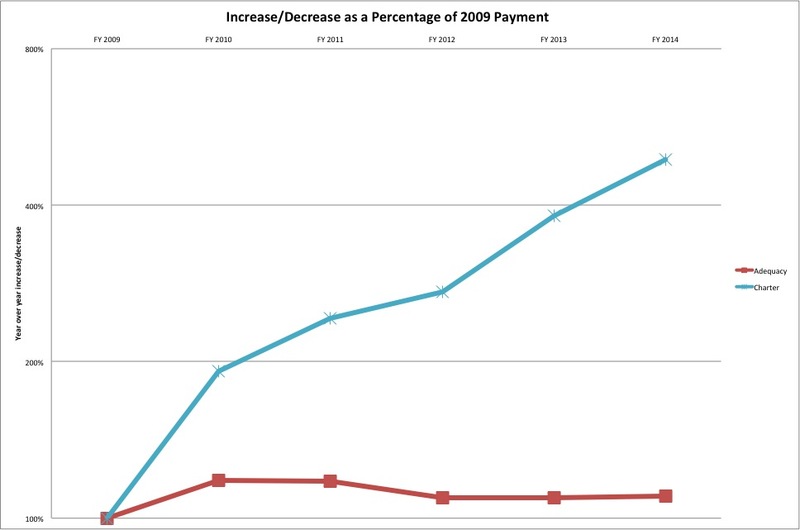 Charter funding (the blue line) was only $3.5 million when this chart starts, in 2009. Under current law, will be $23 million next year. Adequacy, the red line, languished over the same period. Rep. Ken Weyler (R-Kingston) submitted HB 435 last year to increase per pupil tuition payments for charter students by 17%, or $1,231, to $6,729 per student. The bill indexes charter tuition at 50% of the statewide average cost of education per pupil (he may amend the bill to adjust that figure slightly), so charter tuition would probably continue up at around $250 per year. Even under current law, charters could cost New Hampshire $97 million over the next 3 years. HB 435 could add another $19 million to that. Pay for charters with “extra” adequacy funding? First, let’s clear a big error out of the way. As you can see from this table, traditional public schools in New Hampshire have lost an average of 1% of their enrollment each year for the last 12 years and about 1.5% per year more recently. Not 6%. That would be impossible. Then comes the punchline: Rep. Weyler says that the reduction in public school enrollment leaves adequacy money available to expand charter schools. Think about that – especially if you live in one of the 43 New Hampshire communities where adequacy grants are capped this year. In 2014, the State is over $17 million short in adequacy funds for these towns. (Here is the NHDOE adequacy spreadsheet for 2014. Here is a pdf I made highlighting the capped towns.) Dover alone is $1.8 million short. Salem, $1.5 million. Stratham, $743,000. Exeter, $507,000. Fast growing Bedford and Windham are capped at about half their adequacy funds. Actually, as you can see from this NHDOE table, there is no pattern to adequacy funding levels so there’s no real way to talk about excess available for another purpose. HB 435 would preempt efforts to fairly distribute already scarce adequacy funding and use that money to build a second, separate school system. Although the the House supported the bill in January, the Finance Committee voted Thursday to send HB 435 back to the House with a 13-8 recommendation of interim study. Part of the problem was the lack of information about the financial impact of the bill. The fiscal note was a year old when the House voted on it and, although there is a new fiscal note now, it provides numbers for only one year, FY15. Rep. Sue Ford (D-Easton) pointed out that there are unknown but potentially large impacts in future years. Interim study is the right recommendation from the House Finance Committee. In addition, LBA and DOE should do a new fiscal note that provides a basis for discussing future charter costs. LBA may arrive at assumptions different those I used in my own own projections, but the costs are large under any scenario and any legitimate estimate of the impact of HB 435 over at least 3 years would give the House the basis for an informed vote and the potential interim study committee the basis for an informed discussion. By ANHPE in Bills, Charters in NH on February 23, 2014 .